Day after day, middle-aged American consultant Alan Clay and his young IT team sit in a tent in the Saudi Arabian desert, waiting for King Abdullah to show. Their company has prepared a holographic presentation in hopes of winning the bid to supply technological infrastructure to the King’s un-built city. This is the backdrop for Dave Eggers’s novel about a man undergoing a midlife crisis. Alan is deeply in debt, can’t pay his daughter’s college tuition, and he has discovered a growth perilously near his spine. Alan wants, once again, to be an impressive businessman: to close the deal. But an elusive King, strange customs, and his pent-up emotions all conspire to derail his plans. 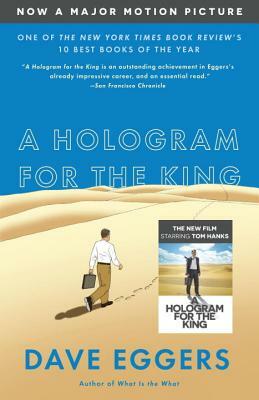 A Hologram for the King is a meditation on one’s usefulness in life. Soon to be a major motion picture directed by Tom Tykwer and starring Tom Hanks, Tom Skerritt, and Sarita Choudhury. In a rising Saudi Arabian city, far from weary, recession-scarred America, a struggling businessman named Alan Clay pursues a last-ditch attempt to stave off foreclosure, pay his daughter's college tuition, and finally do something great. In A Hologram for the King, Dave Eggers takes us around the world to show how one man fights to hold himself and his splintering family together in the face of the global economy's gale-force winds. This taut, richly layered, and elegiac novel is a powerful evocation of our contemporary moment and a moving story of how we got here. DAVE EGGERS is the author of nine books, including most recently The Circle and Your Fathers, Where Are They? And the Prophets, Do They Live Forever? He is the founder of McSweeney's, an independent publishing company based in San Francisco that produces books, a quarterly journal of new writing (McSweeney's Quarterly Concern), and a monthly magazine (The Believer). McSweeney's also publishes Voice of Witness, a nonprofit book series that uses oral history to illuminate human rights crises around the world. Eggers is the cofounder of 826 National, a network of eight tutoring centers around the country, and ScholarMatch, a nonprofit organization designed to connect students with resources, schools, and donors to make college possible. He lives in Northern California with his family.